2012 brought us (and by us I mean the spoiled American consumer, particularly here in NYC) more wonderful places to spend our money. One of my biggest wishes has finally come through: Serge Lutens exclusive bell jars are now available for purchase at Barneys and also from Uncle Serge's US website. The markup is outrageous (from €130 to $300) but it's still nice to know that I'm only a 30 minute drive and a parking situation away from my own bottle of Une Voix Noire. Another exclusive line that has finally become more accessible is Dior La Collection Privée. It can be found at Bergdorf Goodman (and select Neiman locations), where knowledgeable SAs will let you smell some of the raw materials that are the building blocks of the collection. Dior's US website also offers the line for purchase. Who can ask for anything more? NYC has gained another fabulous shopping destination over the summer when Swiss retailer Osswald opened a store on 311 West Broadway in the Soho. The boutique is gorgeous, customer service is a dream, and they offer several brands that were not available in NY until now (Parfumerie Generale, Parfums MDCI, Profumum Roma, and Micallef. No e-commerce but they take phone orders. And have I mentioned the customer service? Speaking of e-commerce, Parfum1.com used to be a reliable perfume discounters where you could find coveted old stock, stuff from recently closed stores, and perfumes that time has forgotten. Over the last year they've transformed the business into a semi-niche store with brands from Serge Lutens and L'Artisan to Ramon Monegal, Mona di Orio and some excellent natural lines such as Providence Perfume Company and Sama Parfums. The frequent discount codes make Parfum1 an incredibly attractive option even when one really wants to support local shops. Our bookshelf has gained several new titles this year. There are still not enough of them, of course (compare to any other art or hobby), but it's encouraging to see new or newly-translated perfume books being offered (and some older titles are now on Kindle, such as Mandy Aftel's Essence And Alchemy or Turin-Sanchez's The Guide). This year's notable releases are Jean-Claude Ellena's Diary Of A Nose, Denyse Beaulieau's The Perfume Lover, Alyssa Harad's Coming To My Senses, and Darisuh Alavi's Le Snob: Perfume (review coming soon as the book is currently making its way to me). Bloggers and other perfume fanatics were thrilled about the opening of an olfactory department at the Museum Of Art And Design in NYC. 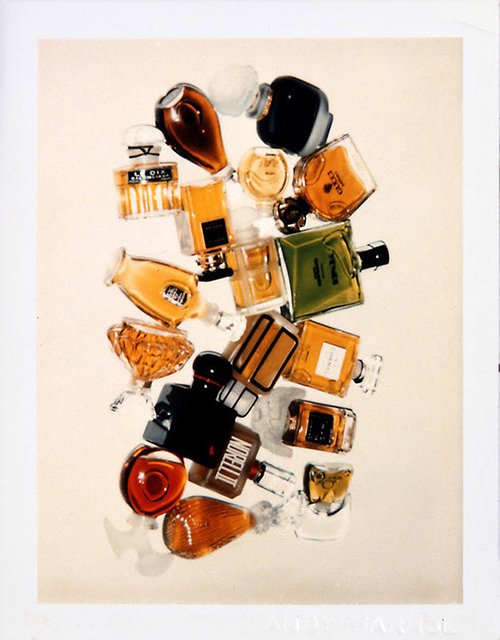 The more people exposed to the idea of perfume as an art form the better off we all will be. There's a lot to delight us about the museum, like the cooperation with perfumer Ralf Schwieger and the fact that perfumers are getting the credit they deserve as artists. However, some questionable curating decisions and the incredibly heavy involvement of sponsors with a direct commercial interest tainted the experience for many (read the review of this exhibition here and some of my own thoughts and questions). A big topic of perfume conversation in our little community involved master perfumer Bertrand Duchaufour and one of his most questionable clients, Gulnara Karimova, the daughter of the ruling dictator from Uzbekistan. There's no doubt that Duchaufour is one of the greatest living perfumers (and probably of all times); also, the question of separating the artist and his art is an old and complicated one. It's just that fragonerds hate seeing the ugly and smelly world outside on its politics and violence entering and tainting our scented bubble. Not to mention the way we see ourselves as worldly, caring and aware. It sure got everyone talking. While personally I can instantly think of ten better candidates for this campaign, from Ryan Gosling to Sir Patrick Stewart, it was fascinating to see everyone and their grandma talking about Chanel No. 5 for weeks. All of a sudden this perfume is more relevant than ever, and the general population developed opinions about perfume marketing. 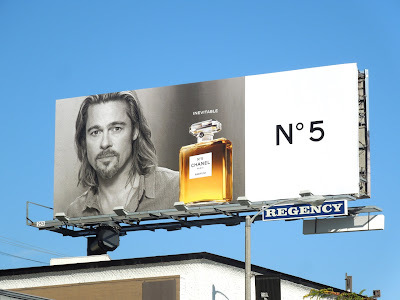 While creepy Pitt is famous for bad personal hygiene and Angie is known to favor men's cologne, these ads and video commercials are still better than a fatally photoshopped Julia Roberts in her Lancome ads. Andy Warhol Still Life Polaroids, 1979. Brad Pitt Chanel billboard via dailybillboard.blogspot.com. Most of the talking I was doing about Brad Pitt after hearing the Chanel No. 5 ads, was "what the heck is he saying?". Between the mumbling dialog and the homeless look I couldn't fathom where the marketers were coming from. I can see Coco rolling in her grave, but I can't see hordes of women running to stores buying No. 5 due to this horrible ad campaign. Personally I can forgive extreme photoshopping. In fact I wish they would have done some on Mr. Pitt. I love Brad's mug on the billboards, but I'm a fan of no. 5 anyway. Happy New Year.